Sometimes it just takes a long time to get a post written up... Like, a really long time. 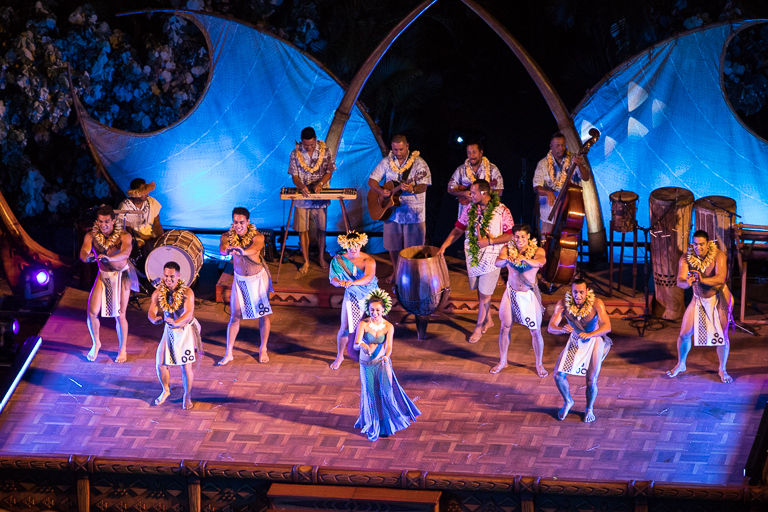 So much that we've already been back to Hawaii since. 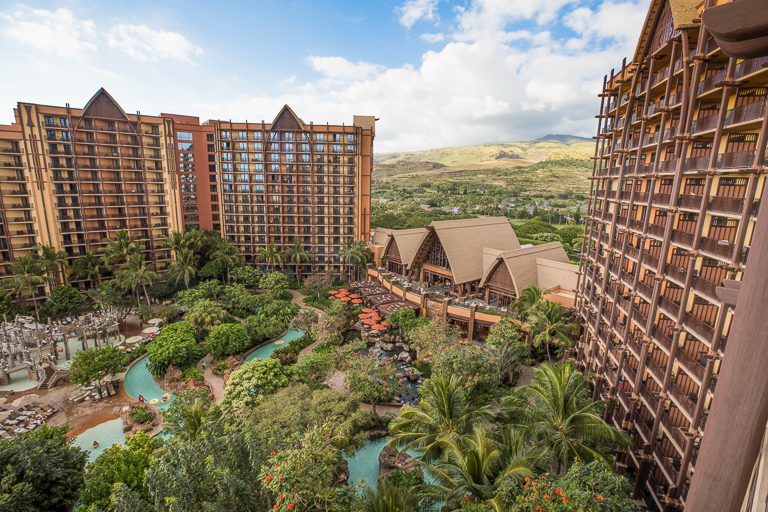 So, continuing this write-up from April 2017, the Flowers family got to visit Disney's Aulani! The first 9 days of this vacation the entire family, all 16 of us, rented a house. 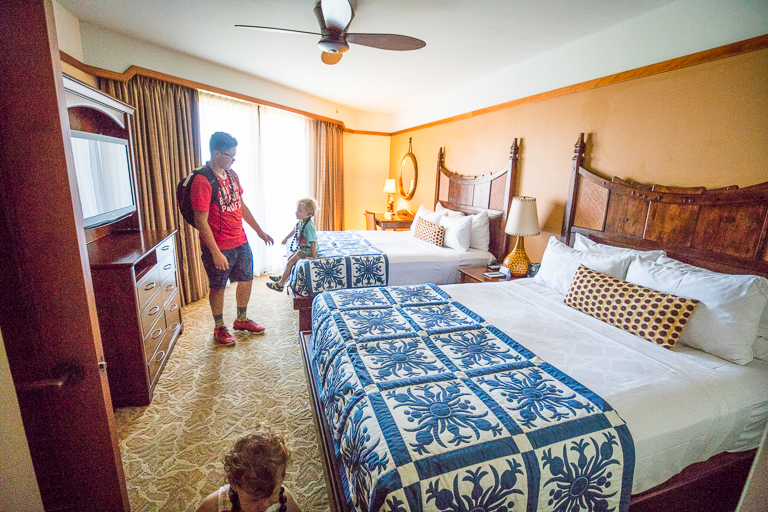 It's been an amazing place to stay with lots of room for everyone. 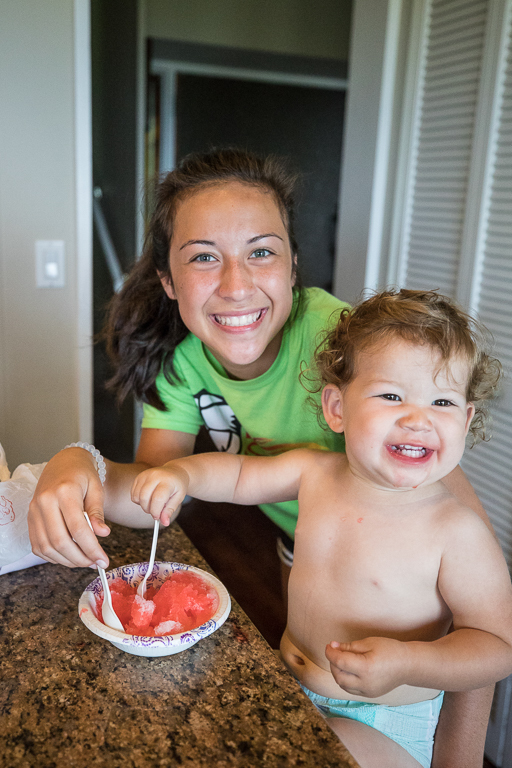 Having our own kitchen, we made use of the full-size freezer to make lots of shaved ice. Just one more before we go? 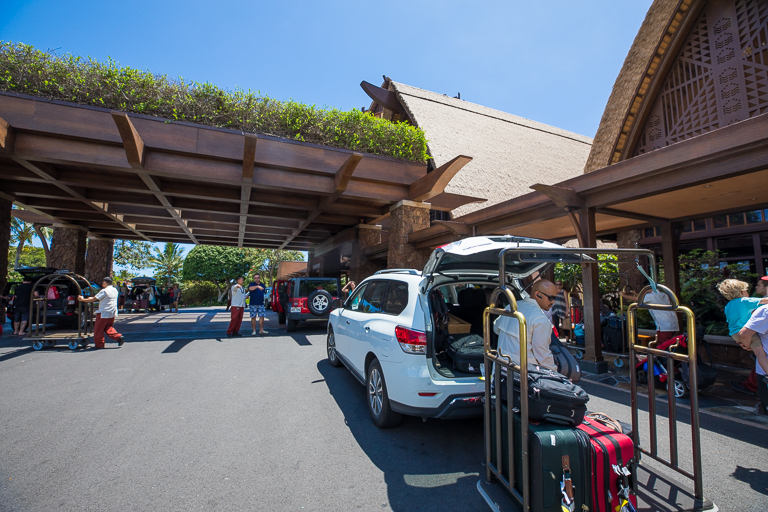 Loading up the cars and driving to the other side of the island to Aulani! 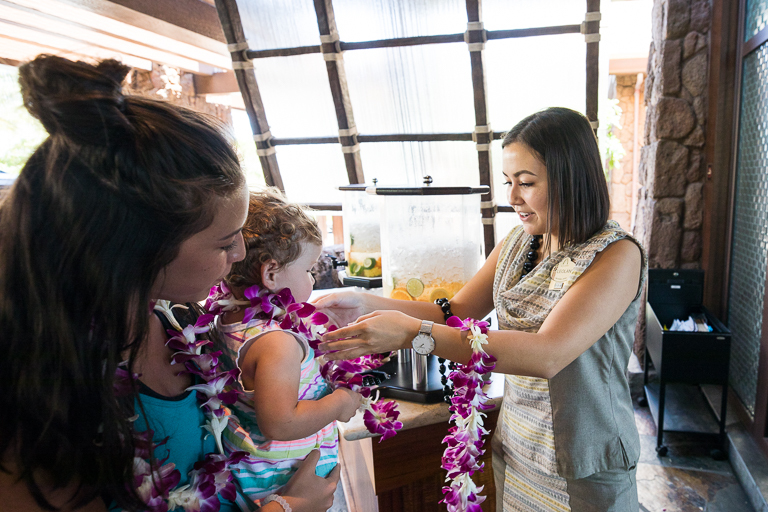 All the girls were greeted with beautiful flower leis. 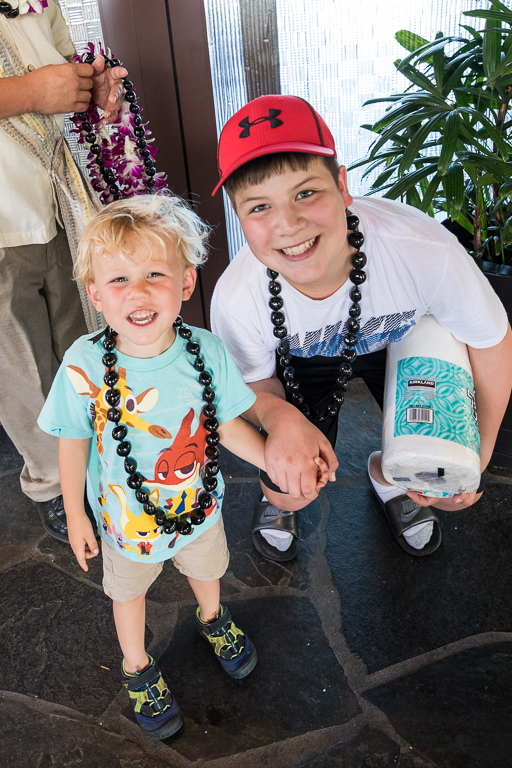 The boys received traditional kukui nut leis. Remember those kukui nuts. We'll see them again a little later. 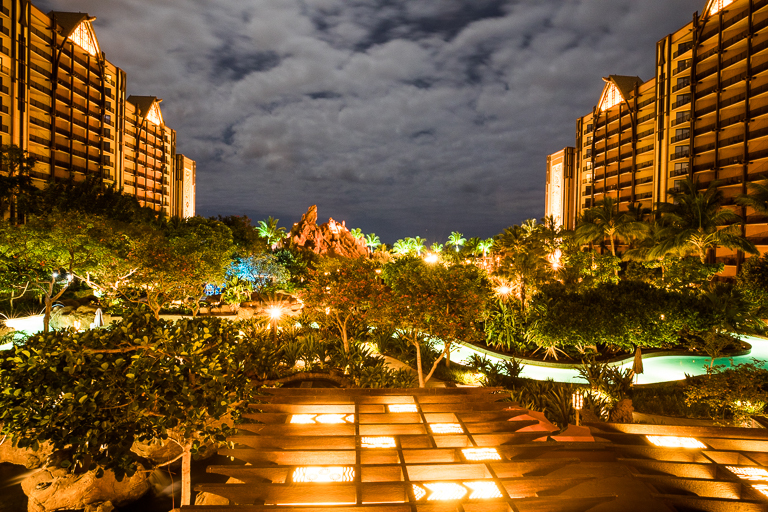 You know it's a Disney resort when... 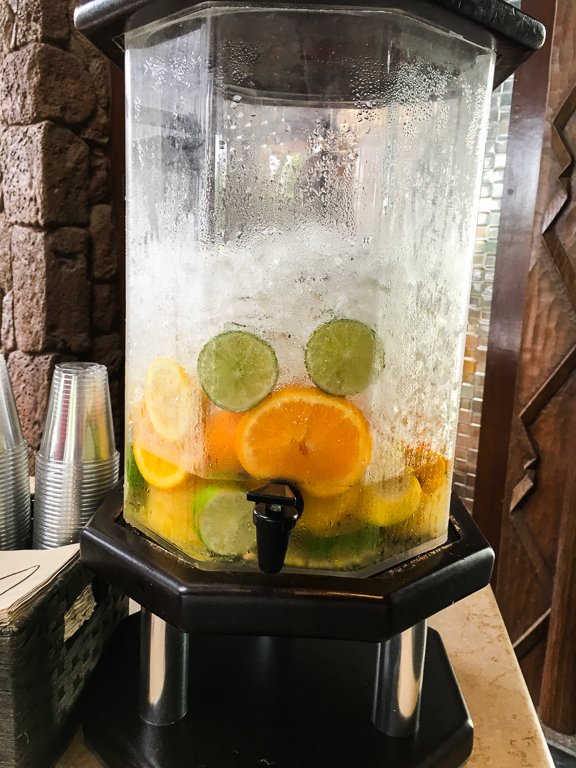 The water cooler in the welcome area has a hidden Mickey in it. 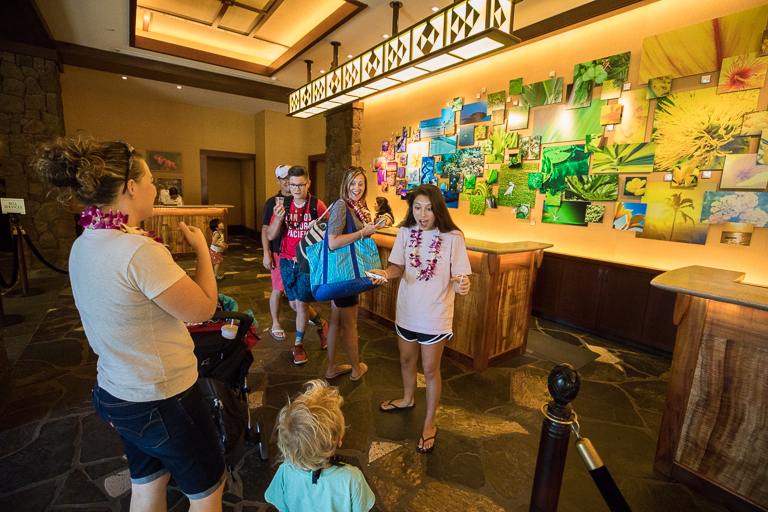 Walking in to the amazing lobby. 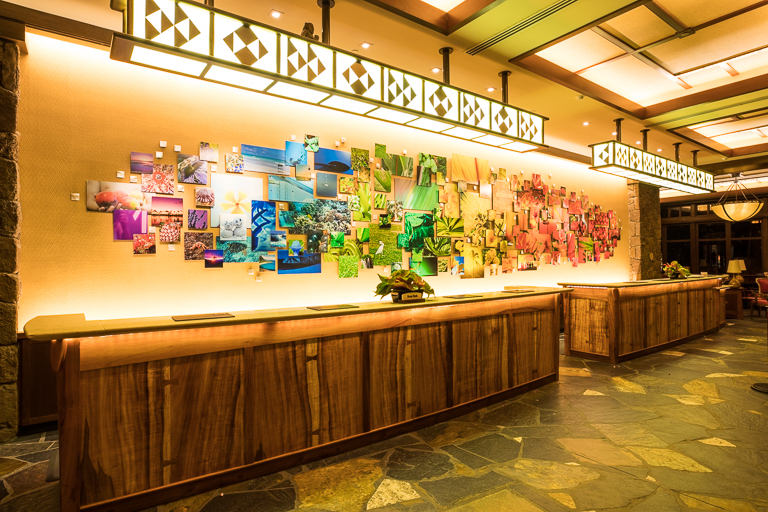 And the reception desk is beautiful too. Nothing overly Disney about it. 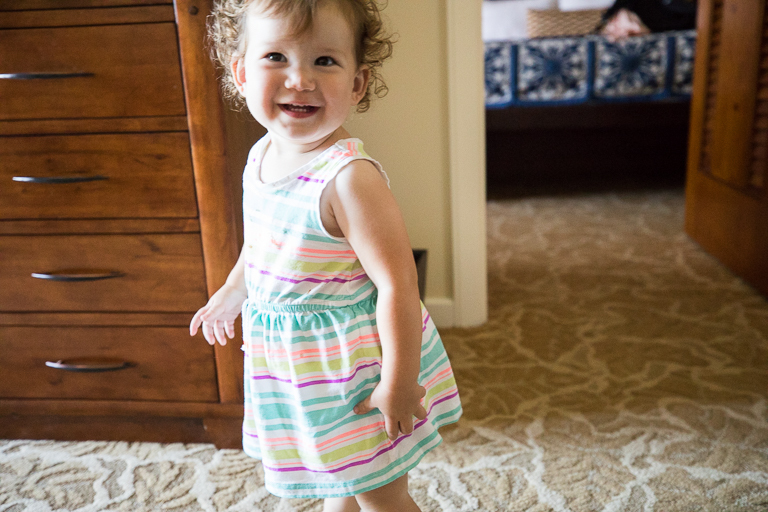 After getting in, we walked over to our room. 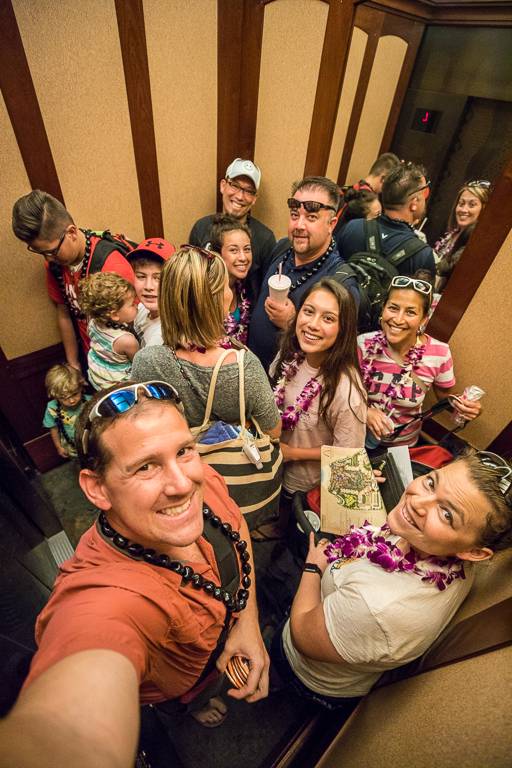 12 of us squeezing into one elevator. We'll be splitting between 2 different rooms. The parents are staying at a resort just down the street since they'll be flying out 1 day early. 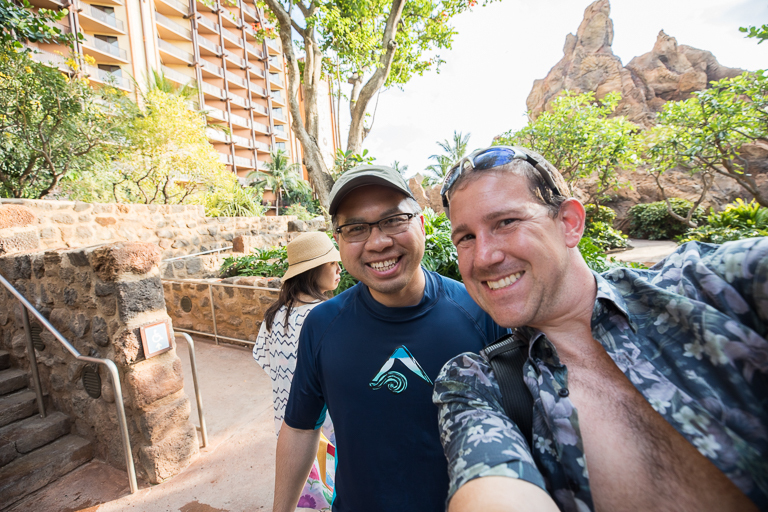 Thanks to my Disney friend Craig, who you may remember from Minnie's Moonlit Madness, we were graciously allowed to use his Friends and Family discount to get a great deal on the rooms. For 8 of us, we booked the 2 bedroom Villa with the Gardens view. Upon opening the door, I knew we were going to love this room. 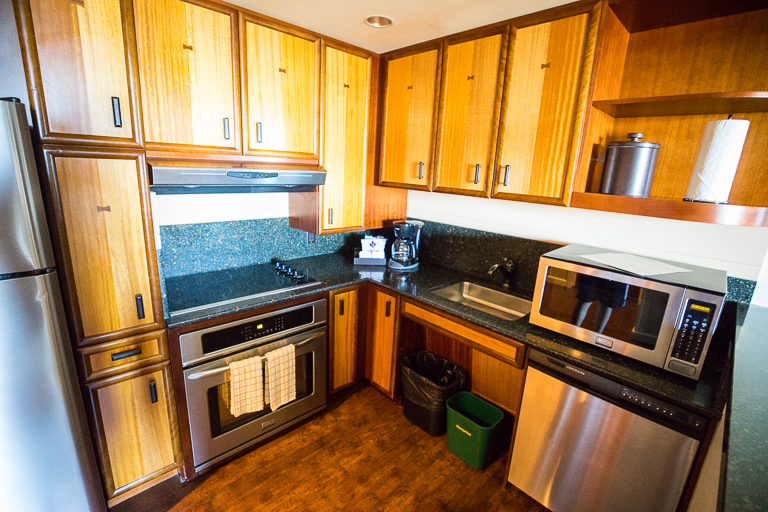 There's a full-size kitchen, a dining nook, and a large living room separate from the 2 bedrooms. It has just about everything you'd want from a hotel kitchen. Looking into the master bedroom. 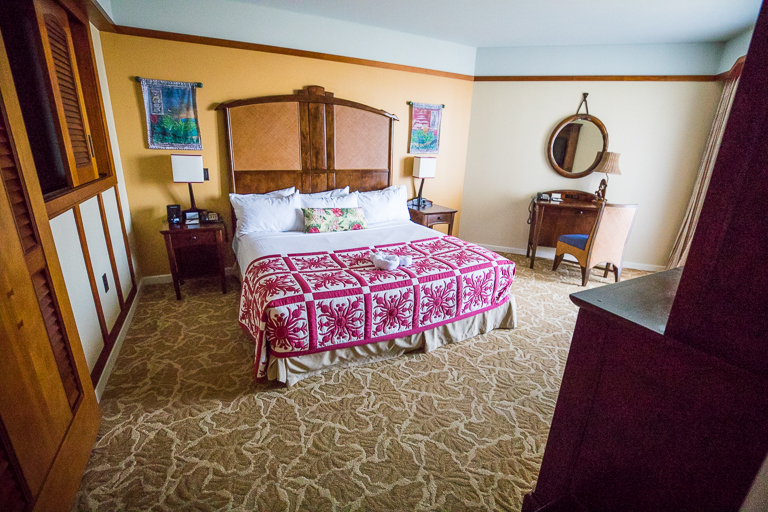 A king-sized bed and a large bathroom. 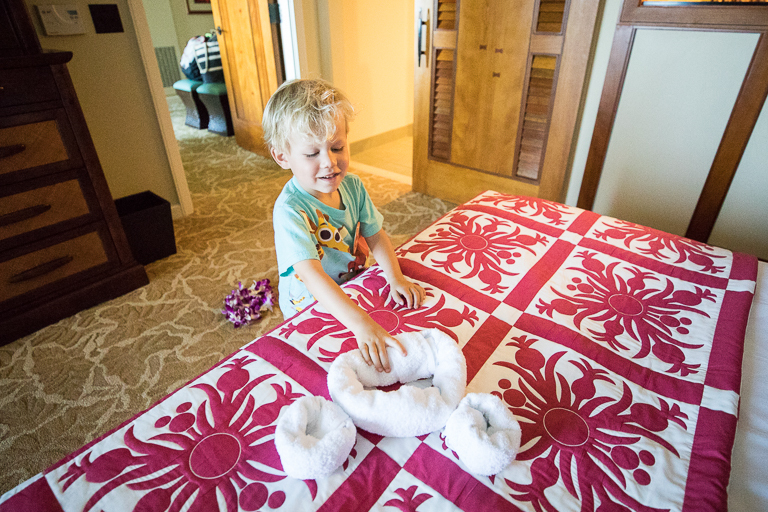 Ian found a hidden Mickey on the bed. Both in the towels and on the bedcover. Looking through the second bedroom. 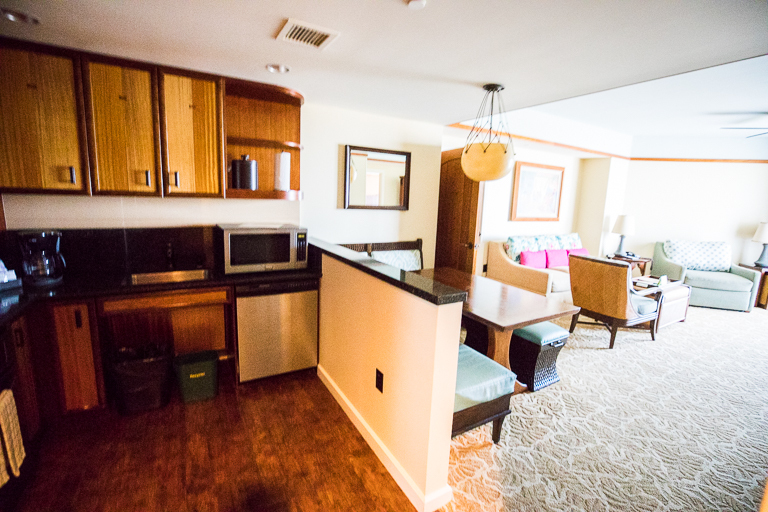 This one has 2 queen-sized beds and its own bathroom. 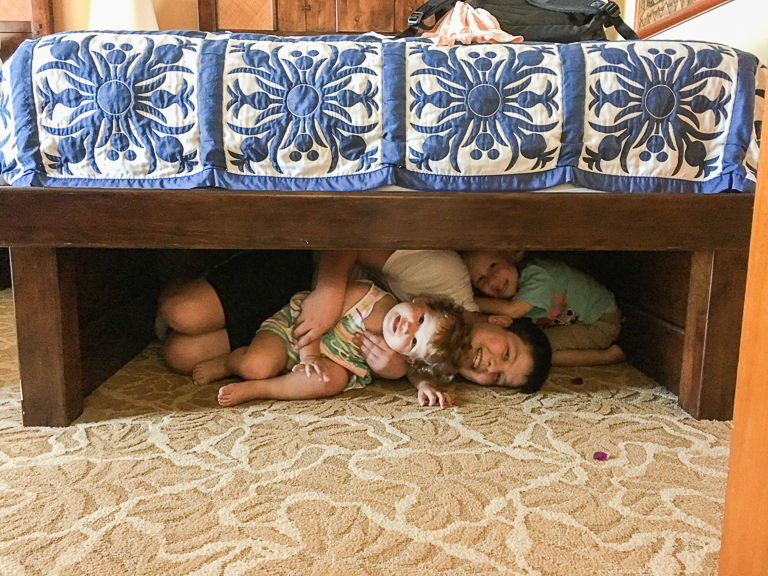 Playing some hide-and-seek before we go explore the grounds. There's two balconies attached to this room. Both overlooking the gardens. 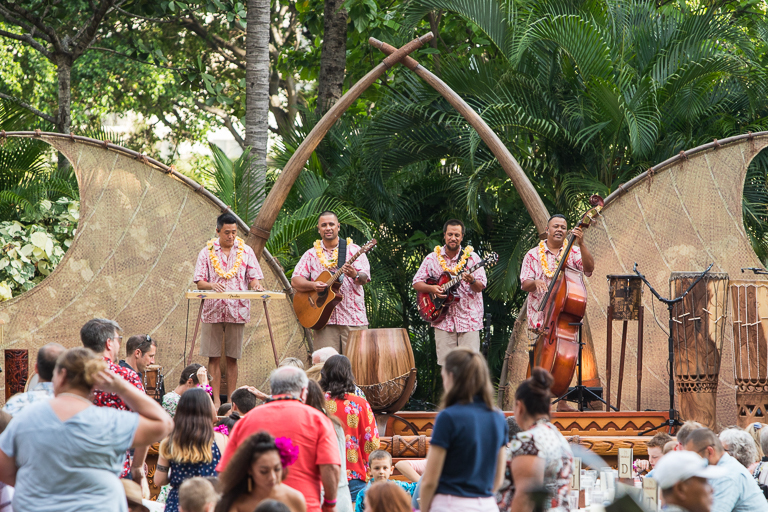 You can see they've set up tonight for the Ka Wa'a Luau. It's only offered twice a week while we were here, with Saturday being one of those nights. 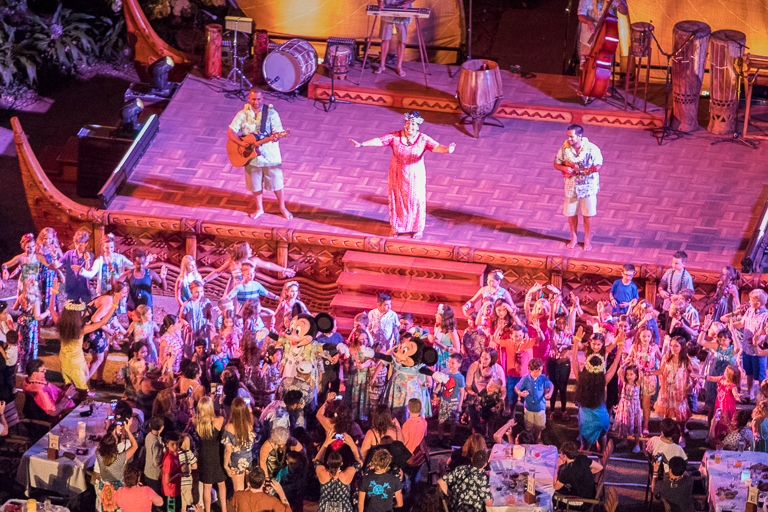 It's an all-you-can-eat buffet along with the dinner show, but at $129 per person it's certainly not cheap. With this garden view we'll get a free view of the show! Just as long as you're okay with heights. And you can even see the ocean. 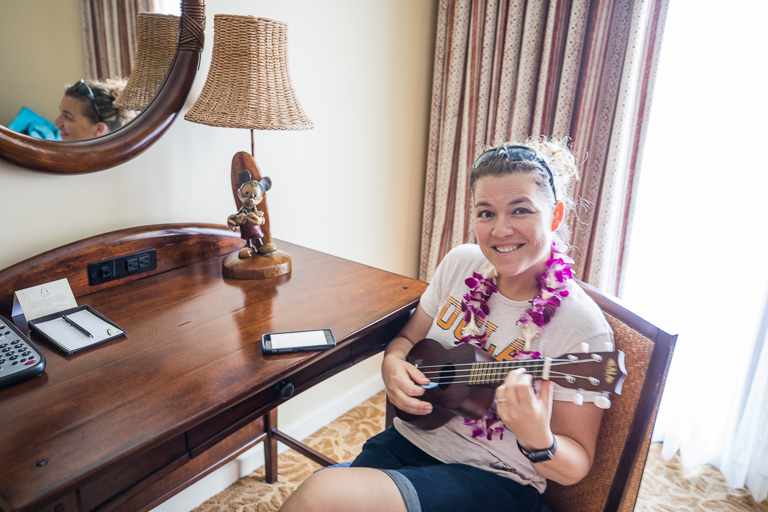 Right next to Theresa playing her ukulele. One more special treat for the kids. 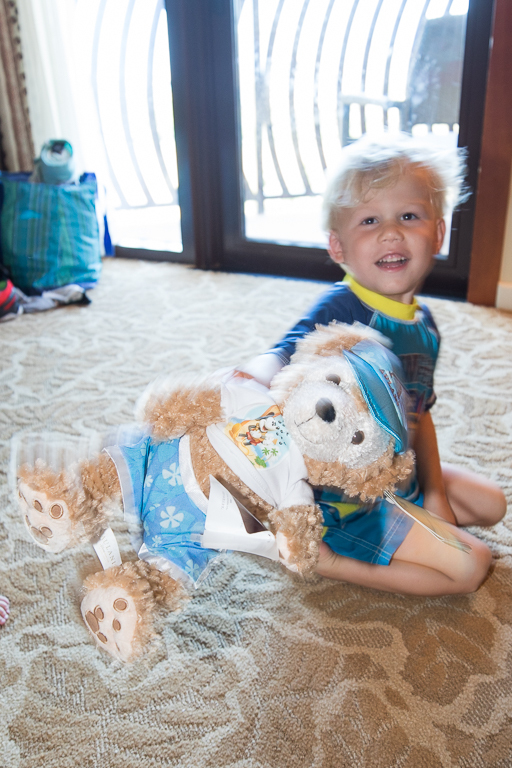 They both love their Duffy teddybears back home. 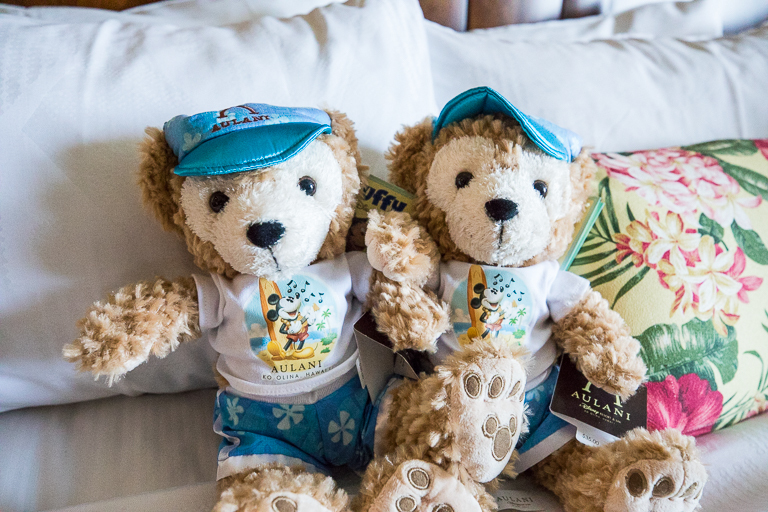 Now Duffy has come to Aulani! As does Alli. It's time to take a nap though... Sleep well while the rest of us go explore the hotel. Of course this boy loves the water. 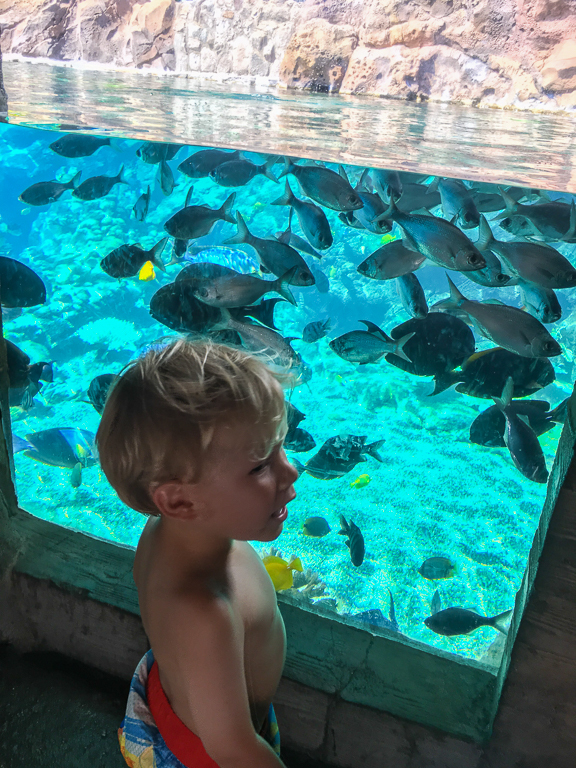 First we looked at the salt-water snorkel tank Rainbow Reef through the viewing window. 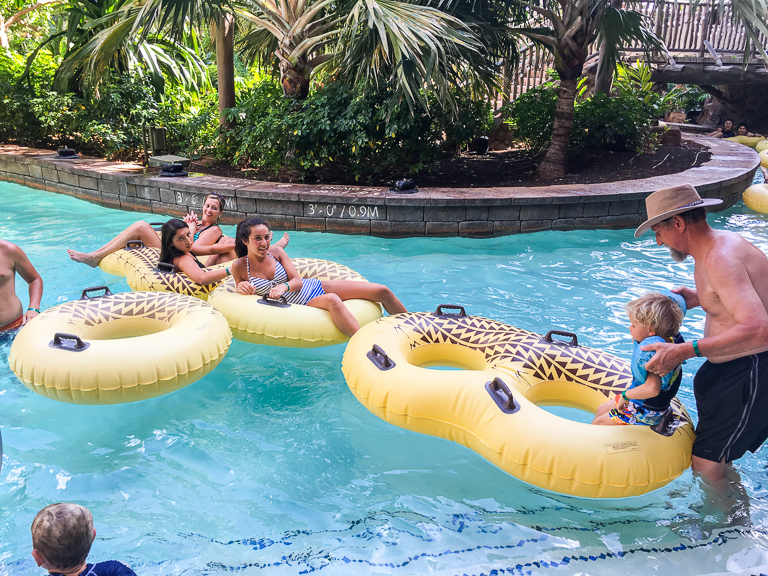 But where we spent the most time on this entire vacation was the lazy river. 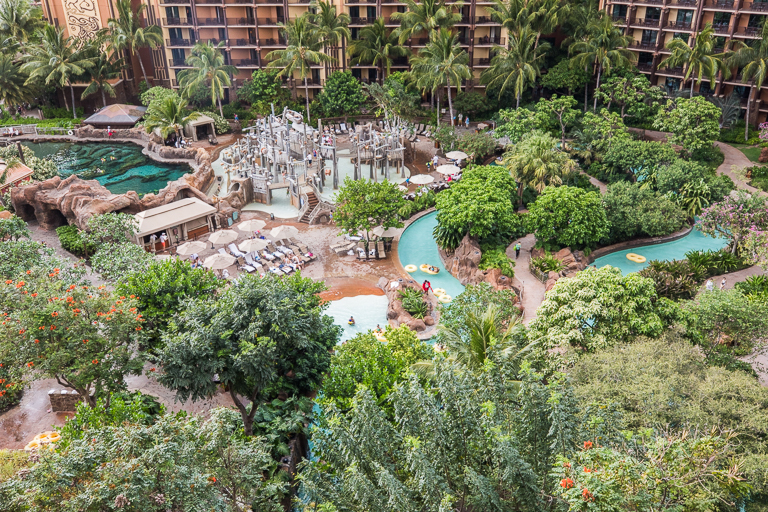 So much better than just a pool, we'd end up spending hours floating through the lazy river. 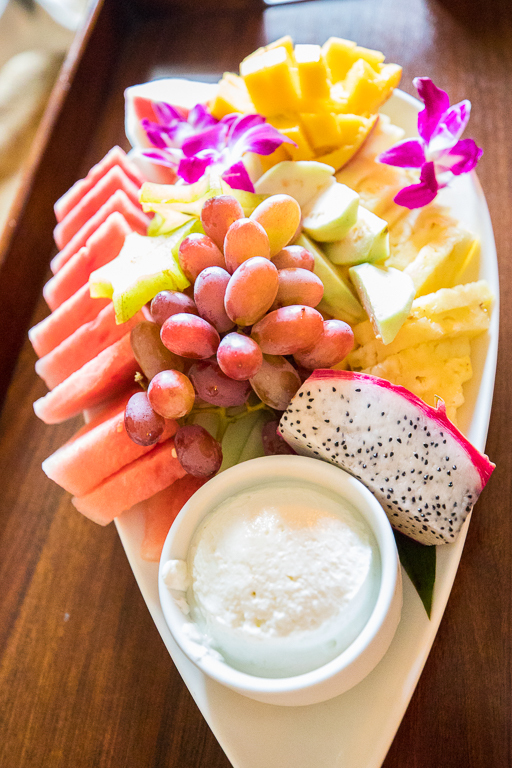 Waiting for us back in the room was this amazing fruit platter. Along with a tasty chocolate and truffle plate. I wonder to whom we owe this good bit of fortune to. 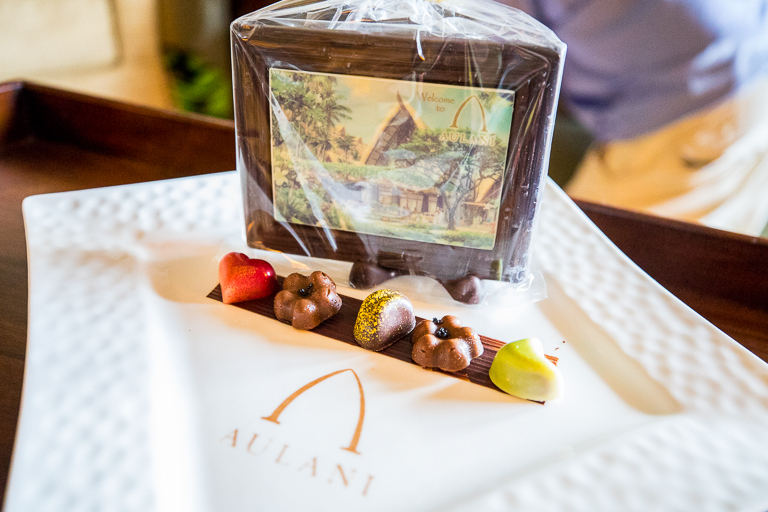 That chocolate Aulani painting looks almost too good to eat. 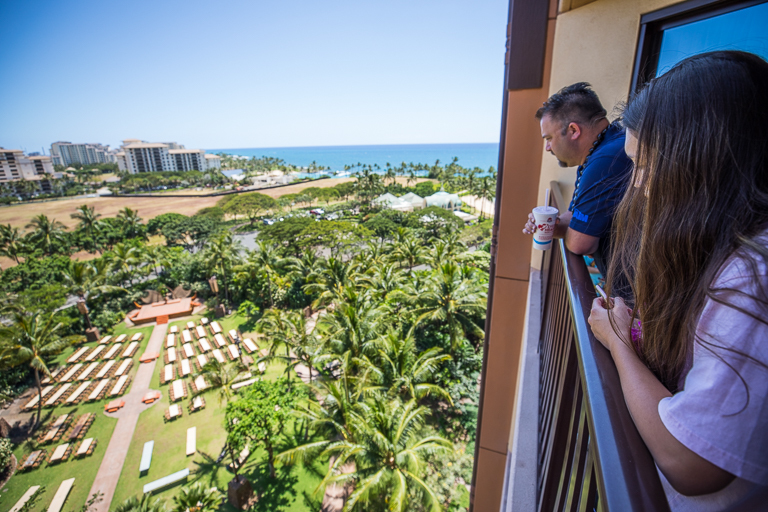 While my family got the Garden View, Donald's family received a very nice upgrade to a Deluxe Studio Ocean View. Doing so meant that he got views like this. Beautiful. The lazy river has started to empty out, but you can just make out Pop Pop and Ian floating along. Someone is up from her nap. 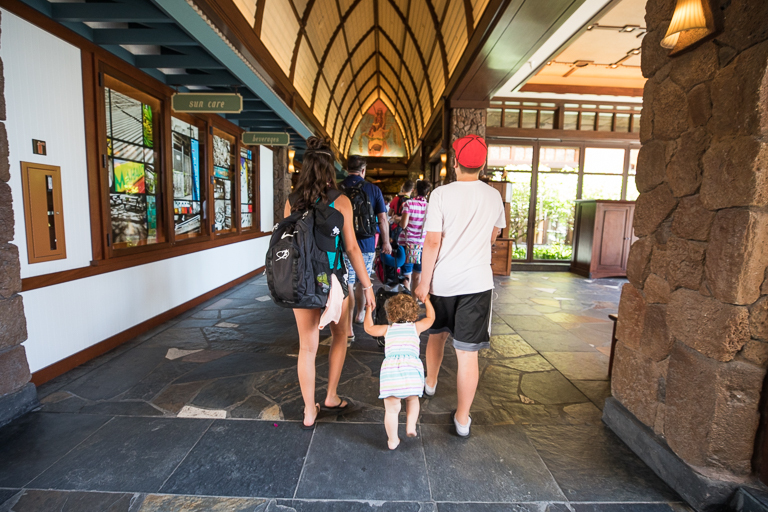 Let's go check out the gift shop. Of course Mickey is popular. 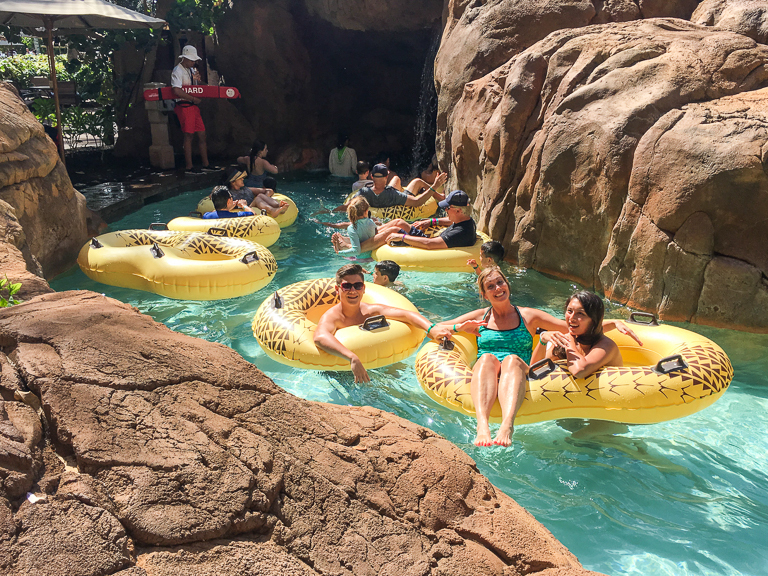 Walked around the lazy river a couple times trying to find everyone else but didn't have any luck. Where could they be? 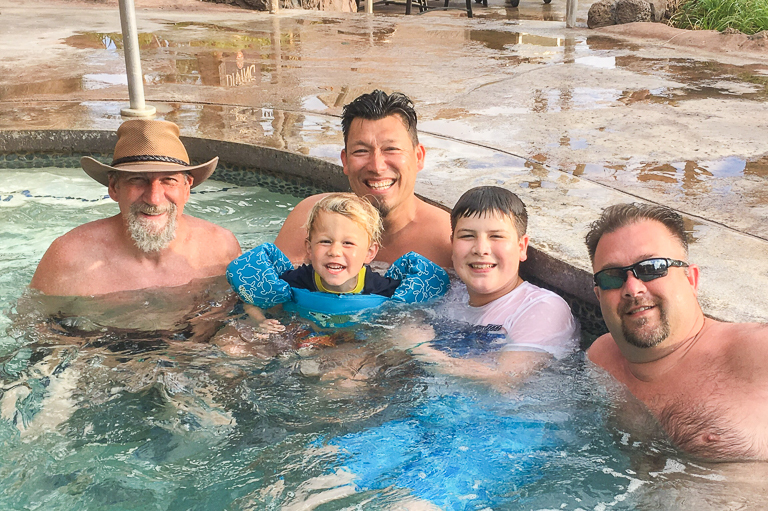 Found them in an out-of-the-way hot tub. There's lots of great places to hang out here. Walking around the pool I recognized someone. Hey it's a co-worker I play volleyball with. Small world isn't it. 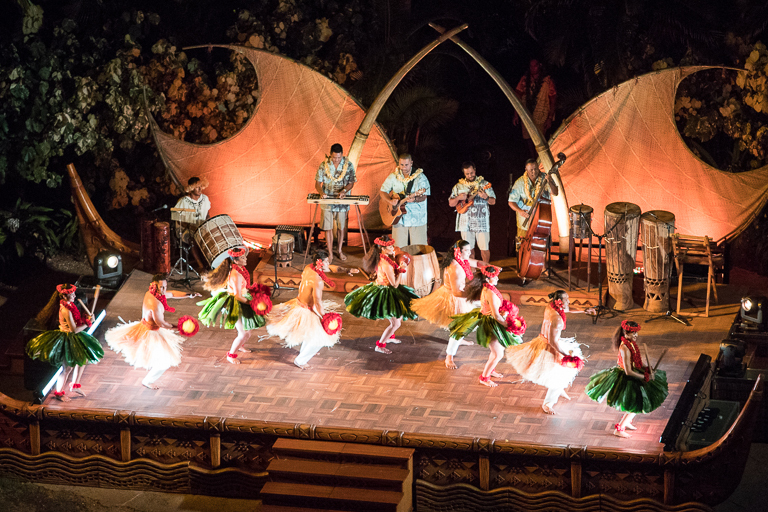 It's getting close to show-time from the Ka Wa'a Luau. I snapped a few photos from the pathway. 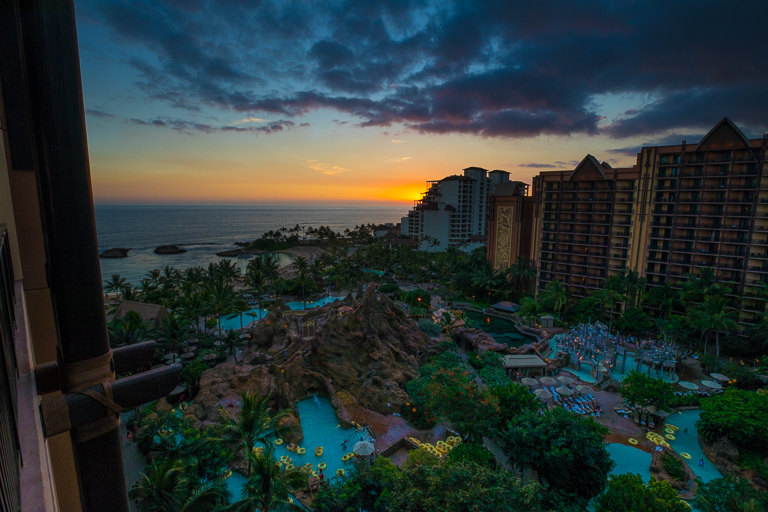 But I had to take off so I could make sure to get a photo of the sunset from Donald's ocean-view room. 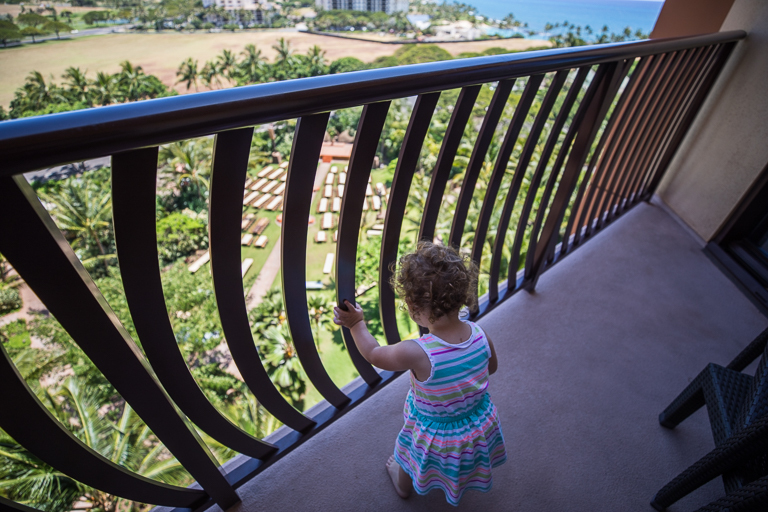 The family got dinner together and ate on the balcony overlooking the luau. I had a good time watching the show. Not my video, but here's someone else's experience up close. Reminds me of Lilo and Stitch. Once the show was over it was time for people to start going to bed. I knew it was my time though to get out and get some photos of the hotel. 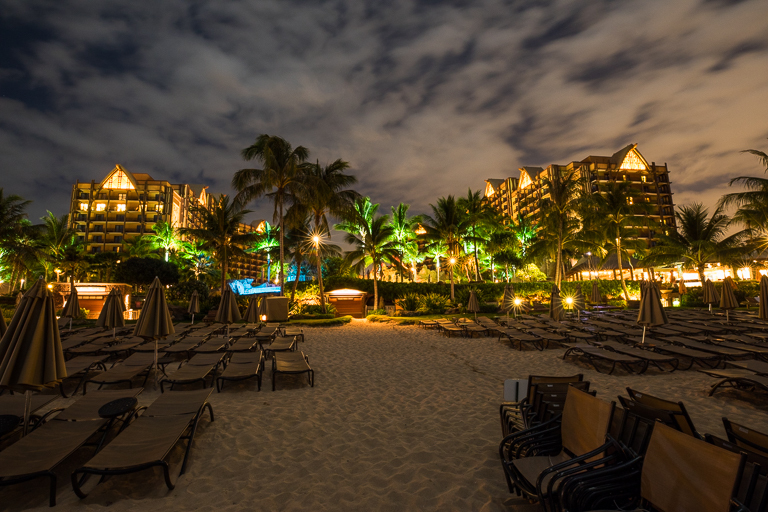 Looking back from the beach at the resort, there's plenty of beach chairs. 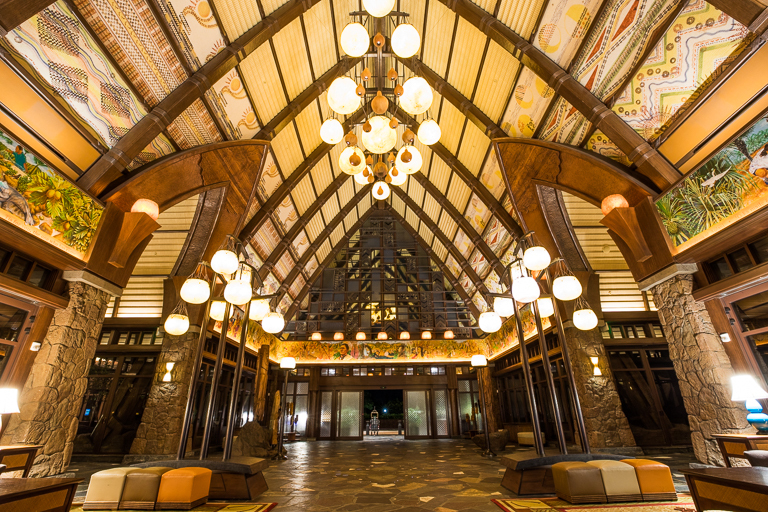 And I love the lights and glow on the lobby. Looking towards Pu'u Kilo, the peak overlooking Waikolohe Valley. I love the little touches Disney does. 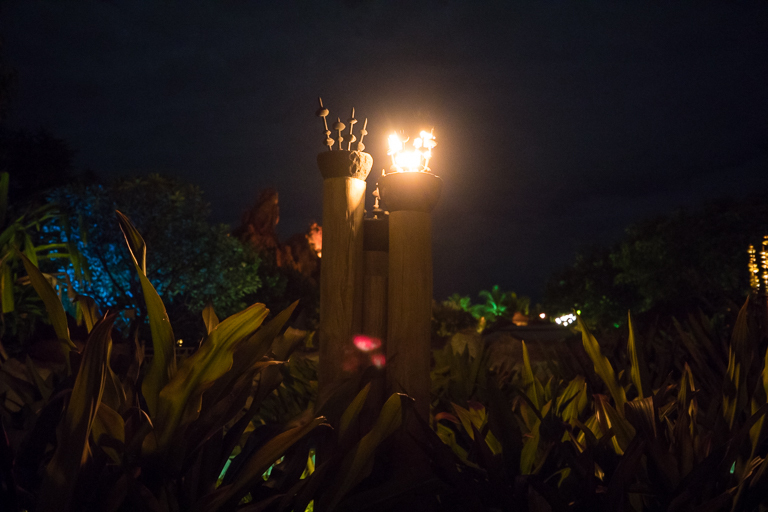 These torches are made to look like they're made from those Kukui nuts that the leis were made out of. 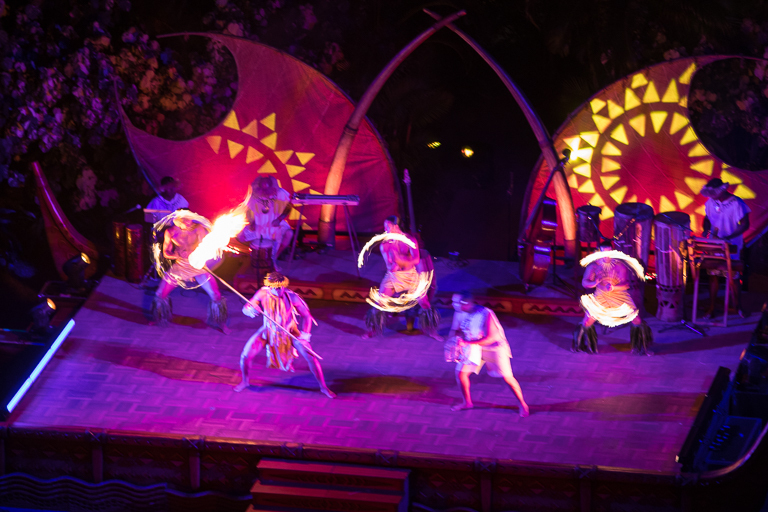 The Kukui nuts, which are also known as candlenuts, are rich in oil, and can burn just like a candle. Each nut can last about 15 minutes. 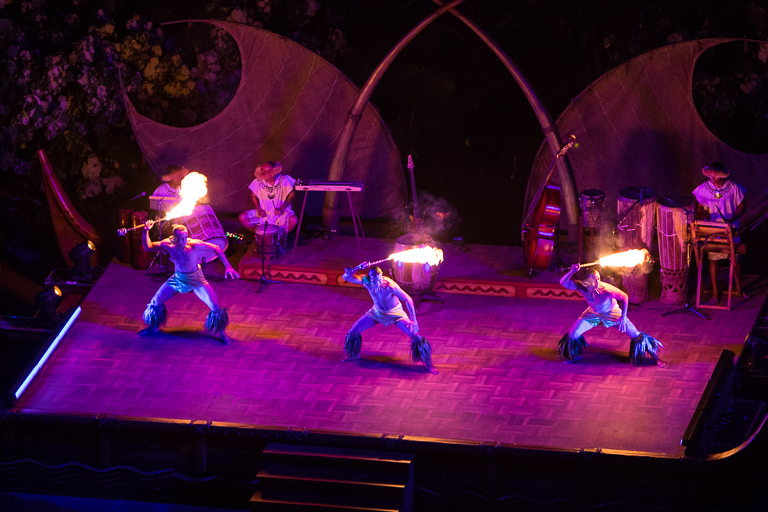 The torches around Aulani are made to look like burning kukui nuts. 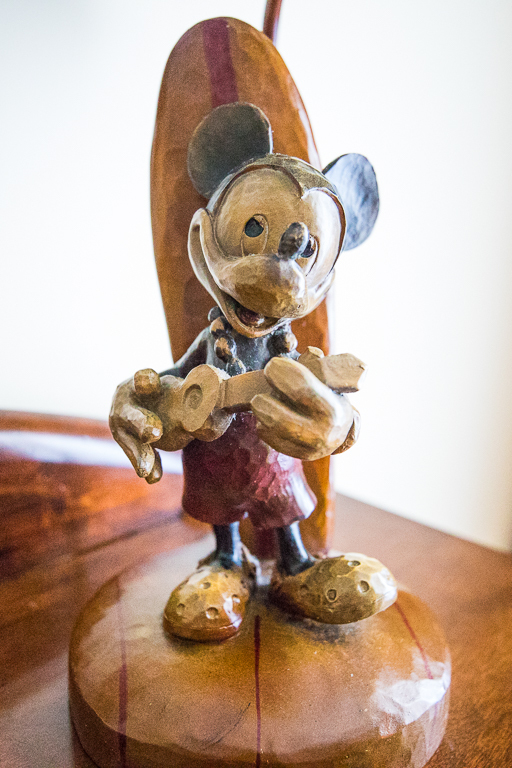 Plus this one looks a bit like a Mickey head I think. Continuing over to the lobby. And another look at that reception desk. 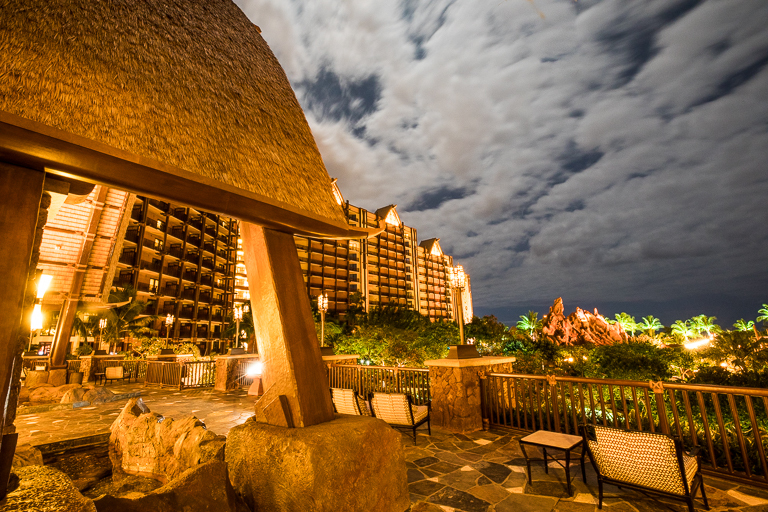 Time to head back to the room and go to bed. 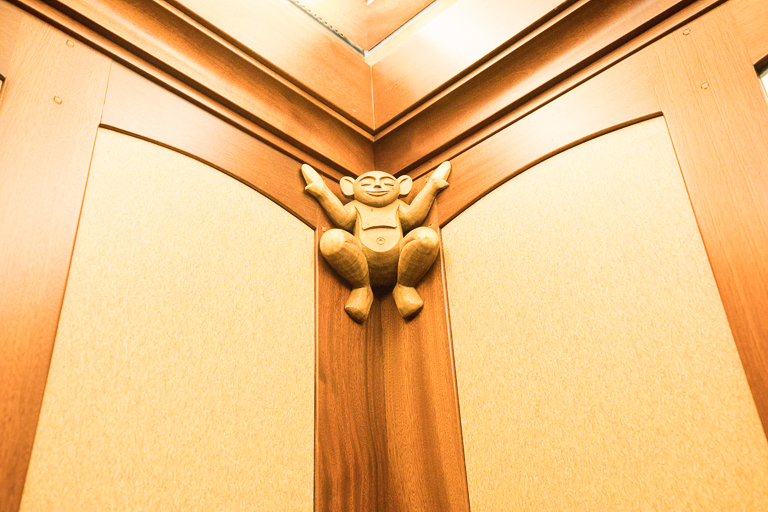 But who is this watching over me from the elevator? I think we'll find out more tomorrow. Beautiful pictures! So peaceful and relaxing pictures. 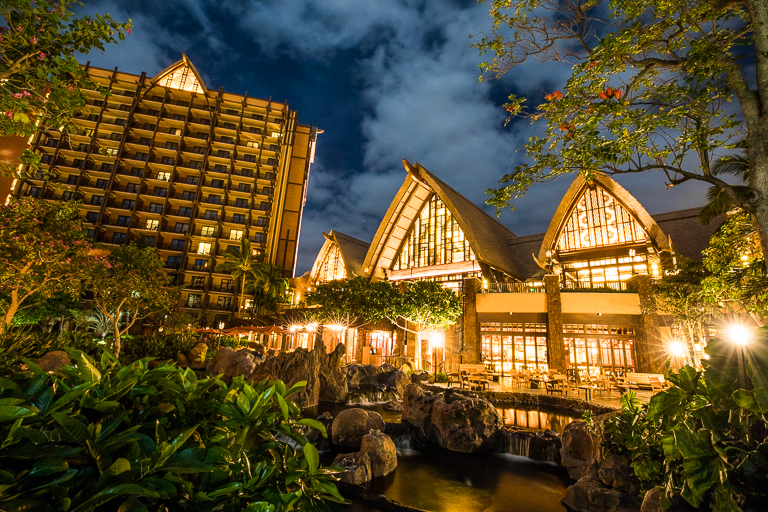 The nighttime lights in the lobby give the room a different feel and look; same thing when seeing the glowing lights from outside the building. That hidden Mickey in the cooler was such a cute idea! Seeing everyone crowded into the elevator reminded me of that "how many people can we squeeze in a telephone booth" game :-) Lastly, I sort of "grimaced" when that unique chocolate picture got "mashed" (felt the same way when the chocolate clock in the Disneyland Dream Suite was "mashed")...just too pretty to eat! 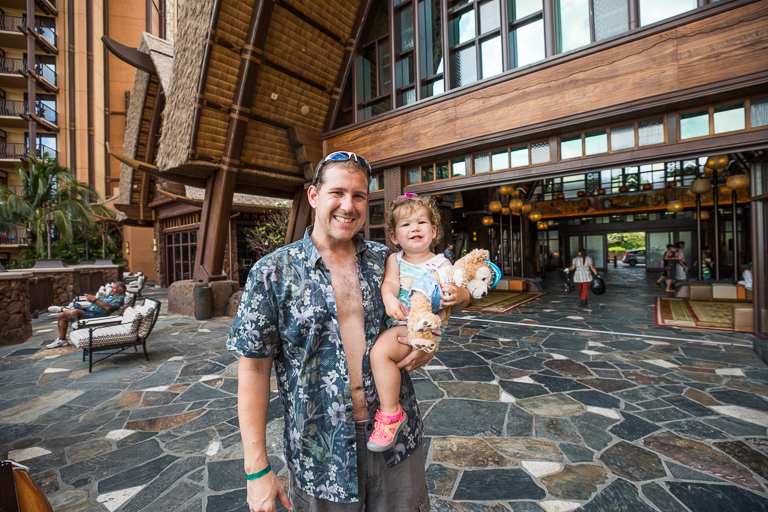 Thanks for sharing your Aulani experience! 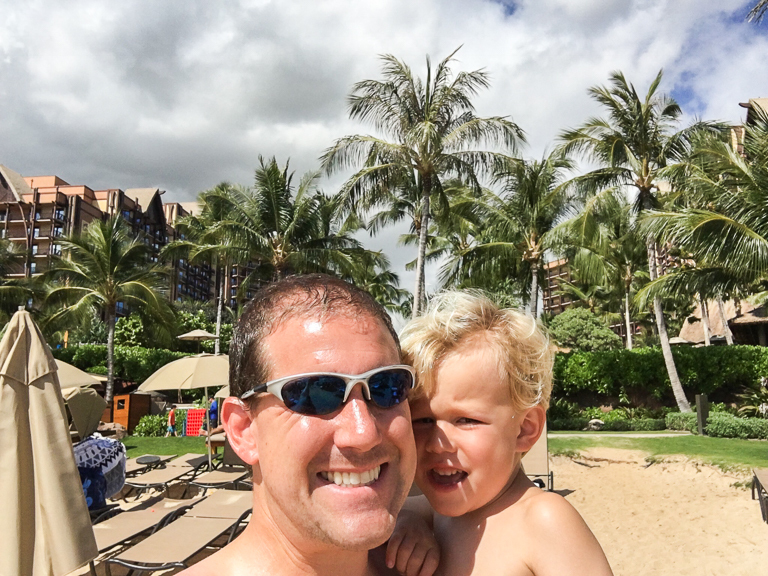 Aloha and Mahalo!! Thanks! 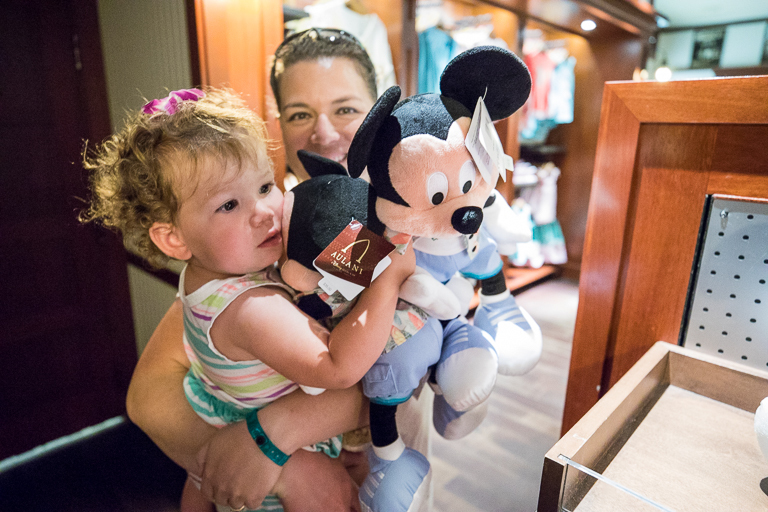 It's the little touches that make Disney Disney. 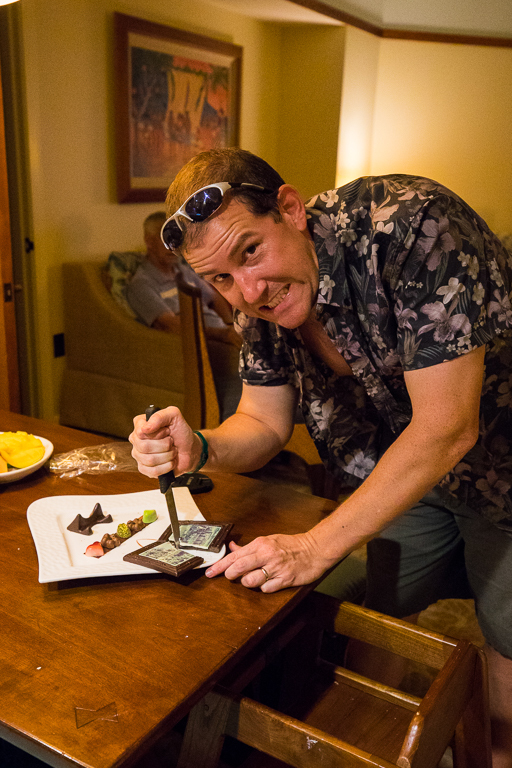 I was a little hesitant to destroy the chocolate, but I knew it wouldn't survive a trip home. Better to enjoy it during the trip. And it was tasty too! Happy Birthday Ian! Celebrating at Disneyland! 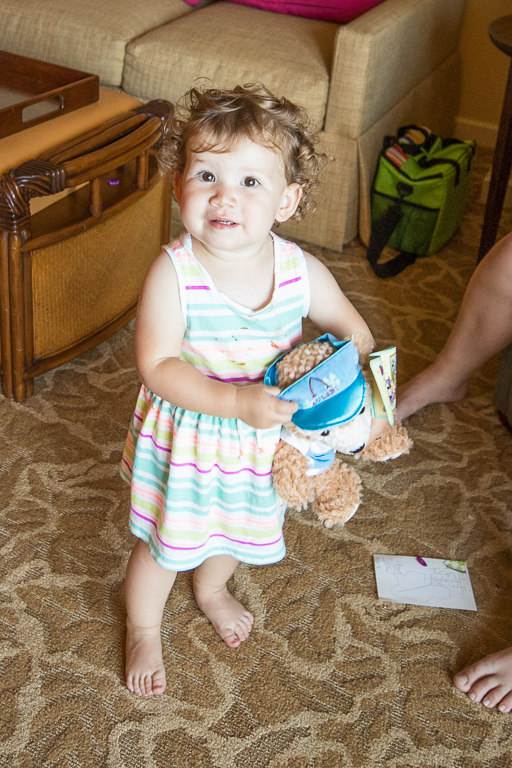 Alli gets her first Disneyland Pass!